Hosted by Youngstown Yacht Club on Lake Ontario, this year’s CanAm Challenge saw an excellent turnout with a variety of One Design fleets, as well as four PHRF divisions representing the United States and Canada. Never ceasing to disappoint, the hospitality at YYC is one of a kind, complete with a fantastic Race Committee team. Saturday evening after racing, North Sails Mike Ingham and Dan Fien recounted their day on the water with fellow sailors. Key takeaways included: making smooth maneuvers, having consistent crew work, trimming the jib without disturbing the flow, and using the headstay to balance power and point while racing. Thanks to the North U crew for providing technical insights to support the competitors and help keep the level of competition at its highest! A highlight of the weekend was the J/22 Grant Team North Sails, led by Alfonso Bringas coming out on top of the fleet with flying colors. 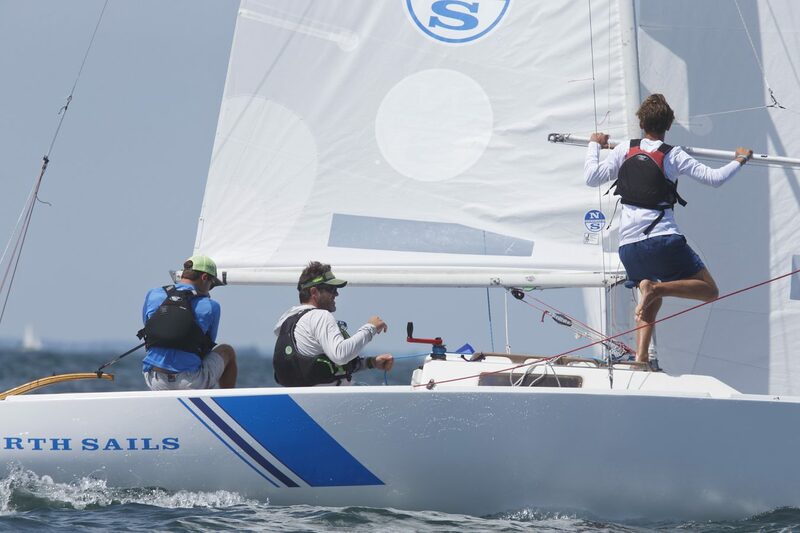 North Sails One Design is proud to partner with the US J/22 Class Association to build its Scholarship Boat Program by providing new sails for the team selected for the grant. With fostering youth sailing in the J/22 Class as the main goal, our team at North Sails has created this unique opportunity for young sailors. Congratulations to Alfonso and his team for placing 1st in the J/22 fleet after only their 2nd event in the boat in a highly competitive fleet. The J/88s, competing in their North American Championship, had an amazing turnout with 13 boats on the line making for some very competitive racing and one of the biggest roll calls at an event for the class. Congrats to Douglas Newhouse and his team on Yonder for staying consistent and finishing 3rd overall in the North Americans. Richard Reid’s Zingara powered by North Sails 3Di won the Beneteau 36.7 fleet with five straight bullets, defining perfection in crew work, fleet management, and tactics. John Mitchele and his 8 Metre team on Thisbe won all but one race, sailing very consistent to take home 1st place in their class. Dan Berezin and his Melges 24 team on Surprise, powered by North Sails, on took 1st overall in their division by three points. In the PHRF 1 – Spinnaker division, Andrew Kooiman and his J/35 team Loyalist took first place in PHRF 1 Spinnaker Division. In PHRF 2 -Spinnaker division, the C&C 29-2 Sting with skipper Joel Doyle claimed 3rd overall. North Sails is a proud sponsor of the CanAm Challenge, keeping sailors out on the water racing each day with overnight sail repair services. Nice job this year, sailors!